Coordinating and getting team members to sit together to discuss a project can always be a problem especially if the team members are located at various places. With collaboration assistants such as Notable – a Firefox add-on application, web designers and programmers who have logistics problems probably can minimize their coordination difficulties when they are working on a web design and coding project. With Notable installed to your Firefox browser, users can conveniently capture the page they are looking at when they click on to the Notable button appearing in the Address bar. Users can thence annotate the page image and also the HTML code. 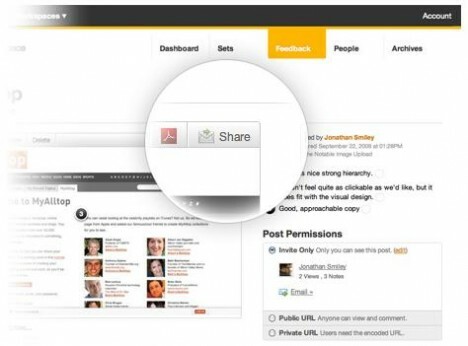 Once it is saved, users can upload it to a workplace that they have created on the Notable site with only a few clicks and share amongst their team members. Notable offers users the opportunity to set up a workspace with 3GB storage space and allows a maximum of 3 members to interact within the workspace for free. Users who need additional workspaces and more storage need to subscribe to the various pay plans offered by Notable, ranging from $24 to $119 per month. If this coordination approach is useful and acceptable amongst all team members, the subscription fees will still be worthwhile investing in the long run as it saves time and travelling expenses.